A plan to erect a Holocaust memorial in front of the Teaneck municipal building received a go-ahead from the town council Tuesday night. 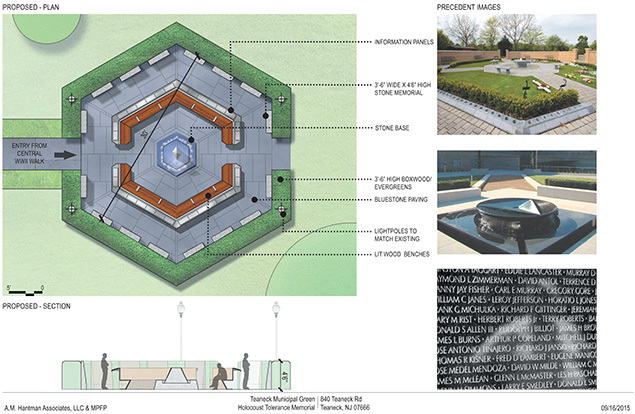 The plan would pair the memorial with one commemorating the plight of enslaved Africans. The approval is a milestone in a three-year effort by the Teaneck Holocaust Memorial Committee. It paves the way for township officials to begin drafting the necessary legal documents. “I want to commend you for working together on this project,” Teaneck Mayor Lizette Parker told the two memorial committees. The council heard from the Holocaust memorial’s new architect, Alan Hantman. Mr. Hantman, a 25-year resident of Teaneck who now lives in Fort Lee, was appointed by President Bill Clinton as the chief architect of the U.S. Capitol. 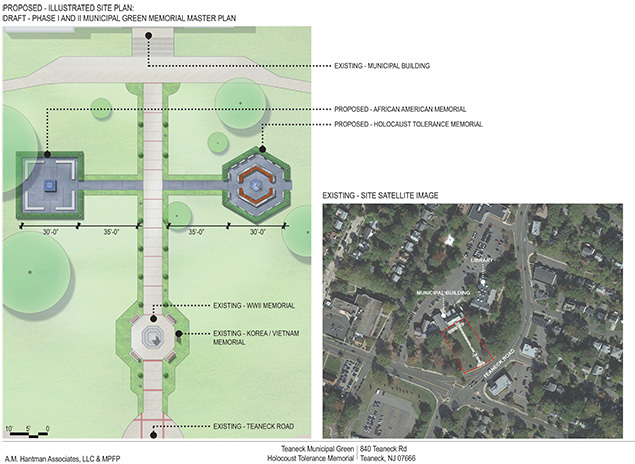 In his new design, he focused on how to integrate the proposed memorials with each other and with the municipal green’s existing World War II memorial — and, as requested by the council, leaving open the possibility of adding more memorials at some other time. While the Holocaust monument’s design has not yet been determined, Mr. Hantman envisions benches around it, with enough space to allow 20 or 25 people to sit. Behind the benches would be something he calls “reading rails,” which would provide information about the Holocaust, perhaps linking to online resources. “It would be great if we could have a whole syllabus in the schools that would teach both the issues of the enslaved African community and the Holocaust issues and whatever issues we might ultimately have on the municipal green,” he told the council meeting. The outer ring would be made of stones; donors could use those surfaces to memorialize names of family members who died in the Holocaust. This has been a constant element of plans presented by the memorial committee, headed by Steve Fox and Bruce Prince. After the presentation, the council voted to approve the spirit of the proposal and authorize the township’s legal counsel to begin drafting the ordinances that would be required to implement it. Those ordinances will have to be ratified by the council at a future meeting. There were five votes in favor of the proposal, and one abstention. The call to memorialize enslaved Africans had originated in response to earlier discussions of the Holocaust memorial. After council members advised the groups to work together, “We invited representatives from their groups to come and see our presentations,” Mr. Fox said. 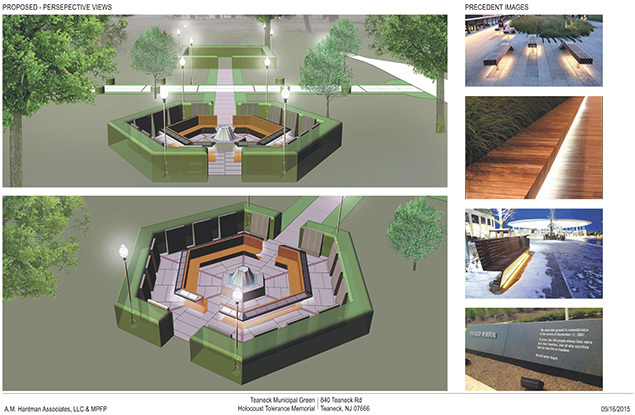 “They were thrilled.” While Mr. Hantman’s plan does not propose any details for that memorial, it gives them a complementary space and footprint in the municipal green. The Holocaust memorial committee has not yet begun raising money for its memorial. “People are not looking to give money until you have something concrete,” Mr. Fox said. After Tuesday night’s council meeting, the moment of concrete planning has gotten closer.